Illustrations of the Japan Expedition, 1855. A magnificent folio of six (6) large ("Elephant" folio) high quality hand colored lithographic prints (36 1/2 x 26 in - 92.5 x 65.5 cm) was produced and published by Eliphalet Brown, Jr. in 1855 and printed by the lithographic printers of Sarony & Co, New York (4 of the 6), Boell & Michelin (1 of the 6) and G.W. Lewis, New York (1 of 6 and cover sheet). The lithographs are after watercolor paintings by Wilhelm Heine. This set is sometimes referred to as the "Brown" folio or the "Elephant" (because of the size) folio of Japan Expedition prints. It is clear that E. Brown, Jr. was the moving force behind this folio. I have not seen numbers printed. However, Brown gave 100 sets to Commodore Perry who distributed them to members of the expedition. The number of sets sold to the public has not been established. After the rare original art work by Wilhelm Heine and Eliphalet Brown and the actual daguerreotypes taken by Brown, these lithographs represent the scarcest first hand and contemporary images documenting the Japan expedition of 1852-5. Only one copy of the cover sheet has been documented as surviving. The existing lithographs are generally found in large libraries, specialized private collections or government or quasi-government archives and they seldom reach the general market. In 1970 the original Wilhelm Heine watercolors that formed the basis for Brown's "elephant folio" of six lithographs were exhibited in the Residence of the American Embassy, Tokyo. Also, the rare lithographed cover sheet for the set was exhibited. A pamphlet titled The Heine Watercolors was prepared by Roger Pineau, Managing Editor of the Smithsonian Institution Press. It appears to be in the nature of a catalogue for the exhibit. In this publication the watercolors are reproduced in color and the cover sheet in black and white. More information on this pamphlet is here. It is noted that Heine produced his own set of 10 large size lithographs (not as large as these however) which he published in 1856 and titled Graphic Scenes of the Japan Expedition. Heine did not credit E. Brown with any of the art in his work. For more information on the Heine folio, click here. The folio of prints was accompanied by an elaborately illustrated descriptive cover sheet. This cover sheet is pictured in Great Lew Chew Discovered: 19th Century Ryukyu in Western Art and Illustration by Rob Oechsle and Masatoshi Uehara. For more information on this book, click here. The descendants of Commodore Perry sold a complete set of these lithographs in 1993 through Christie's of New York. My write-up of the auction listing follows. Important American Furniture, Silver, Prints, Folk Art and Decorative Arts, Christie, Manson & Woods International, Inc., catalogue for an auction held Friday and Saturday, January 22 and 23, 1993 in New York City. Lot 317 contained "The Property of Descendants of Commodore Matthew C. Perry" and consisted of the six framed lithographs (20 1/4 x 32 1/8 in - 514 x 815 mm) and the lithographic title sheet published by E. Brown. The description notes the title sheet was printed by G.W. Lewis and further states that four of the lithographs were printed by Sarony & Co. and the other two by Boell & Lewis and Boell & Michelin. The description also notes that the lithographs were printed 1855-1856 on wove paper and all but the cover sheet and the "Return of Commodore Perry" were laid down on linen. The elaborately illustrated cover sheet reads "Illustrations of the Japan Expedition." All the prints were described as in "generally good condition" with minor defects. I believe that Christie's was using a term of art when describing the prints as in good condition and that term signifies an item with rather significant blemishes or faults. The "Exercise of the Troops..." print has numerous large dark spots along the top edge of the image area and extending down along the right side. The title sheet and six lithographs are all pictured in the catalogue. The prints were framed and in all likelihood displayed and thereby exposed to the environment in a non-archival type stetting. This lot sold for $30,800, including the buyer's premium, against a pre-sale estimate of $15,000-$20,000. The same, or very similar lot, was auctioned by Christies on January 18, 2008 and realized $49,000 (including the buyer's premium) (see note *** below). For more information on Eliphalet Brown, click here. "Passing the Rubicon" - more information here. These are two of the six "Elephant" folio lithographs. 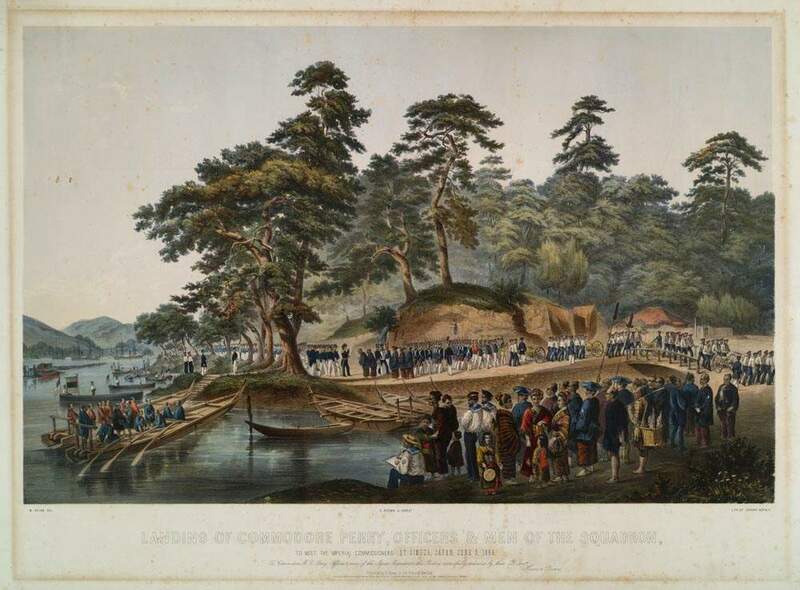 "First Landing of the Americans"
Exercise of the Troops in Temple Grounds, Simoda, Japan in Presence of the Imperial Commissioners, June 8th 1854. (Lithograph by Boell & Michelin) Another view of this lithograph is here. It was typical for large, high quality, lithographs of this time to have extensive descriptive titles which would convey the significance of the image without the need for supplemental text. These six lithographs all have that type of titling. The exact titles listed above are from the bibliography to Samuel Morison's book "Old Bruin" and are found at page 463. The illustrated cover sheet and all six of these lithographs, plus two smaller ones from the Narrative, are presented in black in white on a Library of Congress, Pictorial America, web page. Three of the above lithographs are pictured in The Japan Expedition, 1852-1854; the Personal Journal of Commodore Matthew C. Perry. To see them, click here. * This lithograph was on the retail market in 2003 priced at $24.000. ** Items 1-3 and 5 were offered in the William Reese Co, Catalogue #152 - Pacific Voyages (1997), for $60,000. *** A complete set of 6 lithographs and the cover sheet sold at Christies, NY for $49,000 on January 18, 2008 (Lot 0261).